You don’t need to be an obscure punk act to start an indie label—anyone can make their own records and publish their own songs. You don’t have to register with any official body to become a label. There’s no law that says you have to use an existing record label. There’s no such thing as a proper label—every other label is just like you. You don’t need permission to start your own. Just make records and sell them. You’ll need a free license to press your own CDs and you might want to join a few societies to collect royalties. But that’s all you need. If you make and sell your records (vinyl, CDs, or downloads) you’re a record label. If you get your songs used and arrange to collect royalties on them you’re a publisher. There’s nothing to stop you acting as label and publisher for yourself or other people. A record label simply chooses material for recordings, gets them heard and on sale. A publisher simply collects earnings from the compositions. You can supply recordings and compositions to various specialised markets (e.g. TV, games, film, corporate video, etc.) depending on your material. You don’t have to do everything on your own. You can stay independent and use pro services like pressing, distribution and publishing administration if you choose. If you make your own web site and recordings, and do your own publicity it can cost less than £2 a CD to sell your music by mail order. And less than that to offer downloads. Many artists offer downloads but most still sell CDs one way or another. The Internet is useful for independents but it isn’t magic, it’s just a big public network where DIY is cheap. If you don’t want to make your own web site you can use an off-the-shelf option (Download sites, Selling your CD). Although the record industry ranges from the most basic home-brew DIY through bigger independent labels to multi-national Majors there’s very little real difference between them, other than resources and attitude. Professional recording, mastering, duplication, online distribution and retail are open to most labels, and only the most informal recordings lack bar-coding or appropriate royalty collection today. As you might expect a DIY label has greater freedom of action, less need for outside investment and fewer multi-national partners, while a Major label makes more use of professional promotion, plugging and retail. But that would be the same in any business. A Major record company will have access to the widest exposure and distribution by virtue of its size, but mass production doesn’t reduce the cost of recorded music. The record industry is one of the few where costs at global level are prohibitive and overheads increase with volume. The Internet has not made distribution and retail cheaper for corporate players. Digital recordings with no packaging or physical distribution costs are as expensive as CDs. Paradoxically, the biggest profit margins in the record industry are found among smaller labels and artists selling fewer tracks. At first the Majors controlled record manufacture and later they controlled distribution. These activities were eventually opened up to independent labels and finally to artists. The big four Major labels and their infrastructure are the mainstream. The mainstream business is increasingly label-centred rather than music or artist-centred. This means big labels offer very similar chart-oriented mainstream-ready content. Many independents work in the same way but many don’t. Smaller labels tend to promote writers and artists. The BPI is not limited to Majors and AIM doesn’t only represent pure indies. Independent labels can join the BPI, but labels that are more than 50% Major-owned can’t join AIM. All the Majors apart from BMG have public shareholders and company viability can be adversely affected by late album deliveries (as with Coldplay’s X&Y on EMI, 2005). Some media and music charts use their own rules to differentiate Majors and indies but there isn’t a universal formula. An indie funded, distributed by or licensed to a Major might not be counted as independent for some purposes. The terms Major and independent don’t really mean very much else in practice but an artist-driven indie is different to the Majors in almost every way. A Major label will be in profit before the artist and will make between 5 and 15 times more than the artist on each record. Major label costs are high and they need artists to sell 2 million CDs. Some large independents are similar to Majors so there isn’t always much difference. making contracts based on projects rather than a period of years. Their costs tend to be lower and many can make a good living for the label and artist without mainstream exposure. Independents make more than 80% of all controlled releases, earn about 30% of mainstream revenue and sell anywhere from hundreds to millions of each release. More of their releases make money (only one in ten Major signings are ever released and even less make money The Money Sponge footnotes). Artists often move from independents to Majors as soon as they can because Majors have deeper pockets and more clout in the global game. But you don’t need to sign with a Major record label to get worldwide distribution. Many artists license their material these days. A major will give you an advance if you sign but they’ll take a hefty cut for the privilege. A small number of big record labels have always dominated the market. First it was the recording pioneers, later the top commercial organisations. Independent labels as we know them today took off after World War Two and have been important since the Sixties. The Majors have bought many indies and the big 4 still use more than 50 names of labels they have taken over. Global media, music, advertising and entertainment are all about mass marketing and mass production—quite literally the lowest common denominator. The boom years in the recording industry introduced local venue-based artists to the new mass media mainstream. Today, big music can seem like the only game in town and many newcomers think the only way into the industry is “getting signed”, getting a “recording contract” or “record deal”. Musicians working locally cheerfully call themselves unsigned, unpublished, semi-pro, amateur, etc. rather than what they are. But these DIY and indie acts are the music industry every bit as much as the Majors. Maybe more so. Although mainstream TV and radio is dominated by Major label acts, a 2004 survey found over 4,500 live music events in the UK every day (1.7 million a year, MORI poll). Compare that with TV. The mass and diversity of local acts puts the handful of bland national icons in perspective. There’s a lot more happening outside the media bubble. But the influence of big business gets attention, and it’s easy to forget that what’s happening in music isn't what's happening on MTV, Radio One or in the charts. Every DIY label is an indie. Independence means running your own record label, preferably with your own publishing. The point of independence isn’t spurning the music industry—it’s being your own boss and avoiding arbitrary costs and constraints. Big business services can sometimes help you do what you want—it is possible to use them and stay independent. Indie doesn’t have to be a religion—that would defeat the object. the indie genre, the indie philosophy or anything predominantly autonomous. Musical independence has several technical meanings but none of them are definitive. AIM admits record labels with less than 50% Major label control. Various independent charts use their own criteria for eligibility. If you’re a writer and performer you can also be the publisher and record label, and keep your rights and recordings. You can make direct contact with your audience using the Internet and mail order, supported by live gigs and publicity. This is DIY. Publishing your own work and making your own records is fairly straightforward. The Internet, home recording and cheap duplication make DIY easy and attractive. You don’t have to sign a contract—you work for yourself. Nobody will try to turn you into a copy of someone else. You decide the art-work and which tracks go on the CD. You decide the running order, production and arrangement. You decide your own recording and release schedules. You license what you like, where and when you like, to who you like. There’s no label boss to impose copy-protection or DRM. No one else makes decisions about you and your work. You own the web site, publicity, promotion material and your image. You can charge fair prices and avoid reselling old tracks on new compilations. You can give yourself more points than the Stones and still undersell the Majors. If you make a profit you get to keep most of it yourself (although it may be smaller). breakages (even if there are none), retail at less than full price, record club sales. Recoupable costs will be deducted too (as specified in the contract) and these can include recording. So 10% always means less than 10%. An artist who has paid back their loan and other costs is described as recouped, but they’re the exception rather than the rule. There’s more about record label costs in The money sponge. A DIY artist obviously keeps 100% after expenses, and independent record label deals are often 50/50. Major label sales fell after 2000 and recovered to record levels in 2004/5 before falling again. 40% of UK platinum releases in 2002, and 30% in 2003, were independent. Independent releases outnumber the Majors 5 to 1 and although the Majors dominate popular media they’re responsible for less than 20% of CD titles. 25% of download sales are thought to be independent although high volume online retailers don’t promote much indie content. There are several thousand record labels in the UK, nearly all of them are independent. Together the independents are bigger than any of the Major record companies. Independent retailers carry more indie releases than high street record chains. Many low-volume genres (punk, folk, jazz, blues, etc.) are better represented by indies because the bigger labels specialise in mass media and pop chart releases. 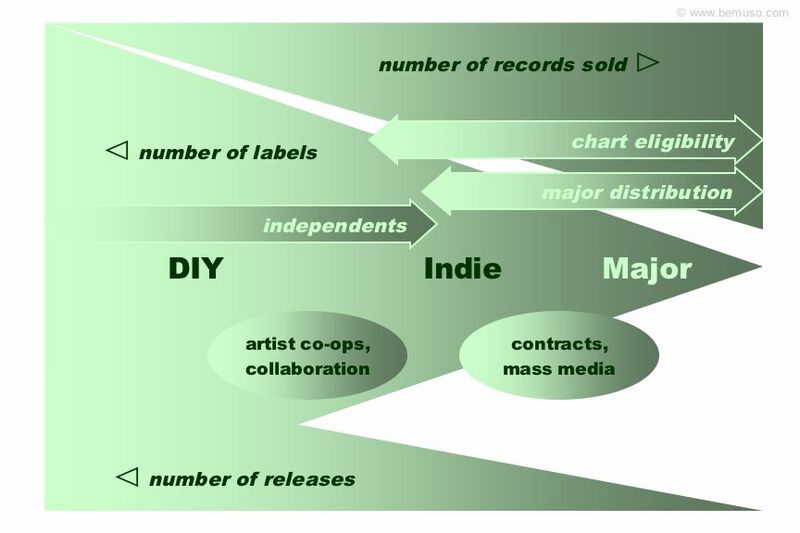 Most DIY and some small label releases, and many CDs sold at gigs are not bar-coded or counted in official figures, so the official numbers for releases and sales inevitably under-report indie statistics.